There's an awful lot of panel sharing going on in the LCD market these days, isn't there? It seems that even some of the most no-name brands are now sporting panels made by a few giant, well-known manufacturers. It's enough to make a consumer wonder whether paying extra for a premium branded monitor is really worth it. With that in mind, what is there to think about Samsung's newly incumbent 24-inch model, the 245T? 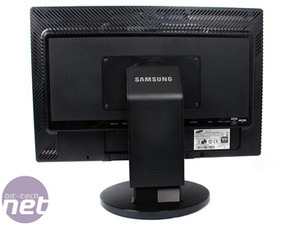 One thing is for sure, if you want a monitor with a quality Samsung-manufactured PVA panel, you don't need to pay over £600 for a monitor with that Samsung badge on the front. There are plenty of other screens with Samsung PVA panels inside, and some can be had for less than £350. 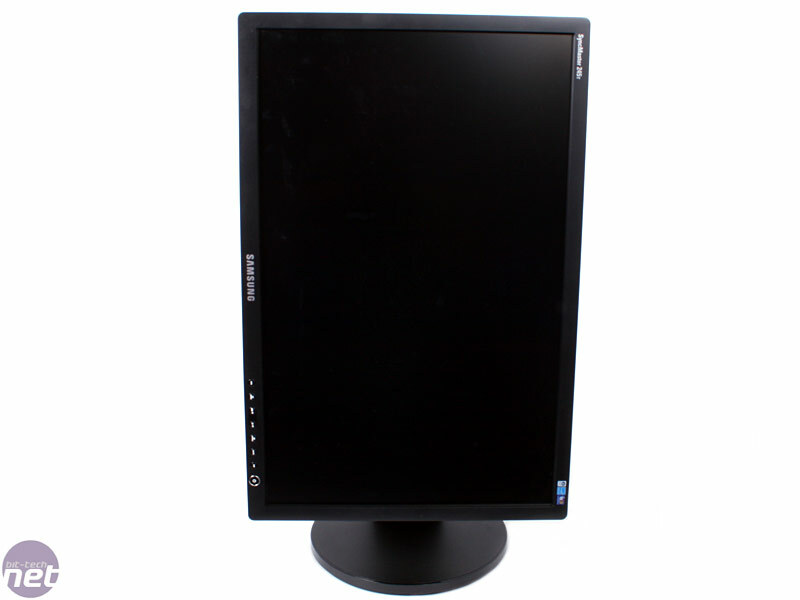 Hence, the key question is not whether the new 245T is a good monitor. Instead, the question is this: Can the 245T really be worth nearly twice as much as the lesser branded but similarly specified opposition? 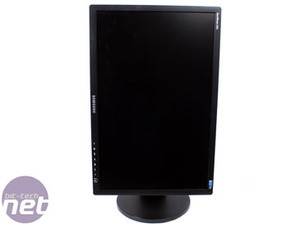 That's what we're here to find out...and we just happen to have a much more affordable 24-inch widescreen on hand, one powered by a Samsung PVA LCD panel. That'll be the Hyundai W241D-PVA. The 245T is hardly the last word in swishy, swanky styling. The aforementioned Hyundai (with its glossy black and white plastics) roasts it for pure desktop presence, for instance. But thanks to the high quality of its construction, it nevertheless has a certain understated class. The bezel is a slim 15mm all the way around which emphasises the display, although the entire main panel is quite a weighty 80mm thick. 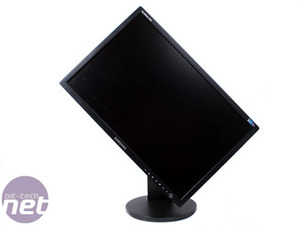 Front to back, you'll need at least 25cm of desk space to accommodate the large, sturdy base. 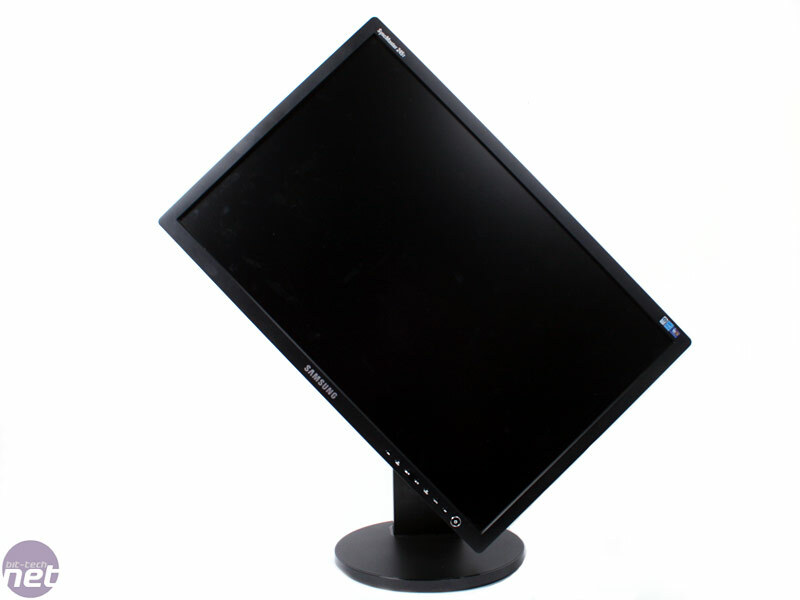 The no-nonsense OSD controls are an extremely welcome and user-friendly feature, as is the stand's comprehensive adjustability. Not only are swivel, tilt, rotate and height tweakage on the menu, but they are all incredibly smooth to operate yet easily hold any position set without the need for clips or locks. Given the panels size and weight, it's not light enough to move without some effort - but it certainly doesn't require brute force either. In terms of inputs, most of the usual suspects make an appearance. Digital connectivity takes the form of a single DVI port and an HDMI socket, both with HDCP support. However, there is no DisplayPort available. On the analogue side, it has the lot - VGA, S-Video, component and composite. In short, there's very little that you can't hook up to the 245T. It even sports picture-in-picture mode for smooth multi-input juggling; however, that feature is limited to only component (AV), S-Video and composite, not the digital inputs or VGA. 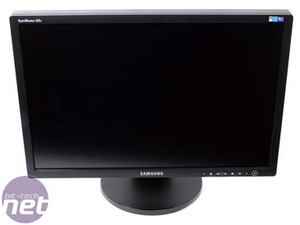 Samsung has offered a peek at a new 18.5" LCD display powered entirely by USB. The HDMI Licensing group has unveiled the new features to come with the next-generation revision of the High Definition Multimedia Interface specification.